One of the six main aims of the Galloway Glens Scheme is to support the long-term sustainability of the region by helping young people to find work and stay in the area, as well as creating a life-long connection with the heritage of the area. The Scheme aims to provide opportunities for people of school age, and all ages, to connect with and be confident in their natural environment. To support this aim, the Scheme has planned a range of projects that will provide heritage skills training, real-world life experiences and education opportunities. This focus of activity will be overseen by Helen Keron, the new Galloway Glens ‘Education & Community Engagement Officer’. Helen joined the team this week and brings a wealth of community and project management experience to the role. Helen has also supported the Scheme in a voluntary capacity over recent years. I am delighted to be joining the Galloway Glens team and supporting them in their aim of connecting people to the heritage of the area. In particular, I am excited by the range and depth of the educational projects we have planned, from bursary placements to wild camping to training courses. I hope that everyone in the Galloway Glens region will have the opportunity to learn a little more about this fantastic region that we live in, and maybe also learn some skills that will allow them to prosper here. I want to have a particular focus on removing barriers to accessing the opportunities that the Scheme will create. Helen’s arrival completes the staff of the Galloway Glens Team, based here in Castle Douglas. We are most pleased to welcome her to the team. Possibly the biggest challenge facing the region in coming years is the projected ageing demographics of our population. Part of what the Galloway Glens will be doing will be to encourage young people, and those of all ages, to work and live locally. 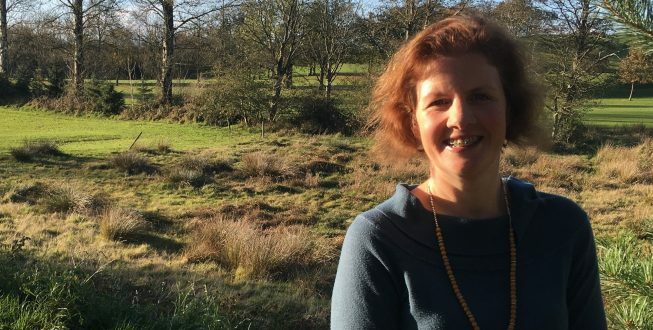 We want residents to feel confident in accessing and harnessing the amazing natural qualities of the area and provide targeted training courses to allow people and businesses to grasp local opportunities, and Helen’s work will concentrate on this. This is such a complex subject but, working with a range of partners, we hope to make a tangible difference to the local economy. The Galloway Glens Scheme is a five-year programme of activity taking place from 2018-2023, working to connect people to the area’s unique natural and cultural heritage through a range of projects up and down the Ken/Dee valley. It is supported by a grant of £2.73m from the Heritage Lottery Fund and a range of other partners including Dumfries & Galloway Council. Photo: Helen Keron on the Black Park path, Castle Douglas. Photo credit: Galloway Glens.